Summary 8 port router with Gigabit Ethernet ports, 2.4 GHz b/g/n AP and built-in 12 IPsec and 5 SSL endpoints. Includes service QoS, up and down bandwidth limiting, session limiting and traffic metering. NETGEAR's latest small-business VPN router is more than the FVS318G with an 2.4 GHz b/g/n access point tacked on. It may look similar to its non-wireless sibling, but it features a completely revamped design with beefier processor, more RAM and flash and new features. There are so many new features that my colleague Doug Reid will be doing a full feature review (done) and VPN performance test in a few weeks. For now, I'll just provide an overview and report on the routing and wireless test results. The 318N features a rack-friendly design with all ports and indicators on the front as summarized in Figure 1. Of course, you wouldn't want to actually mount it in a rack, since that would interfere with the built-in 2.4 GHz b/g/n access point that NETGEAR has designed in. I think NETGEAR should have named this FVS318GN since the G in FVS318G does not stand for 802.11g wireless, but Gigabit. Figure 2 shows the rear panel, which includes a good old-fashioned serial console port for out-of-band management and direct access to command line management. Despite its targeted application for business networks, the two dipole antennas are not upgradeable. The 318N's FCC internal photos weren't great for an overall look, but conveniently included close-ups of all key components. But the fuzzy photo in Figure 3 is clear enough to show that there are no heatsinks on any of the components and no RF can over the radio. A 300 MHz Cavium Econa CNS3411 ARM11 class SoC is the router's heart, supported by 128 MB of RAM and 32 MB of flash. 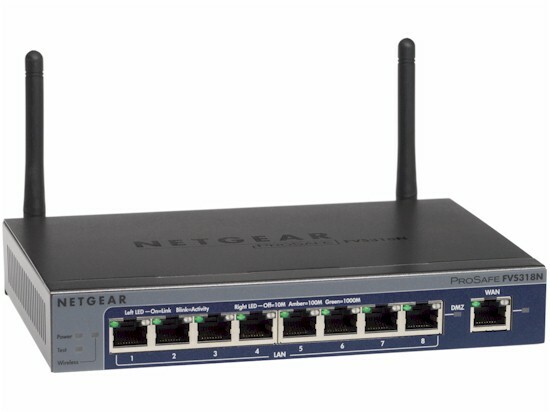 The eight switched Gigabit Ethernet ports come from a Broadcom BCM53128 and a Qualcomm Atheros AR9287 2.4 GHz 2x2 SoC provides the dual-stream N radio. As noted at the top, the N is a very different and much more powerful beastie than NETGEAR's previous FVS318G. Table 1 summarizes the key components. Doug is going to give the 318N a good going-over (done), so I'll just touch on some key features that differentiate the 318G and N. Aside from the 802.11b/g/n radio that supports four SSIDs, the 318N raises the number of supported IPsec tunnels from 5 to 12 and adds support for five SSL tunnels. Also new in the 318N is IPv6 support, and port-based VLANs for both wired ports and wireless traffic.